FROM THE US OPEN – Before Djokovic walked on the court, he knew that if he played well, he would win the title again. He is better than Juan Martin del Potro, he knew that coming in, but he realized that the Argentine was rising, very gradually. If he was very consistent and powerful, he would win. And he did, 6-3 7-6 (4) 6-3. In the second set, DelPo had a few chances, to grab it, but Djokovic stayed in there, out-hitting with his backhand, moving so well, returning a lot, which he had to, because DelPo was crushing his first serves. The Serbian stayed strong, he didn’t play great with his serves, but his backhand beat the Argentine down, especially crosscourt. Plus, his forehand was hard. He wouldn’t allow DelPo to come into the net hardly at all, unless he decided to bend him down, pull him over, and pass him. DelPo crushed his huge forehand a lot, and in the second set, there were times when it appeared that he was getting better and better. Had he won the second set, then who knows? 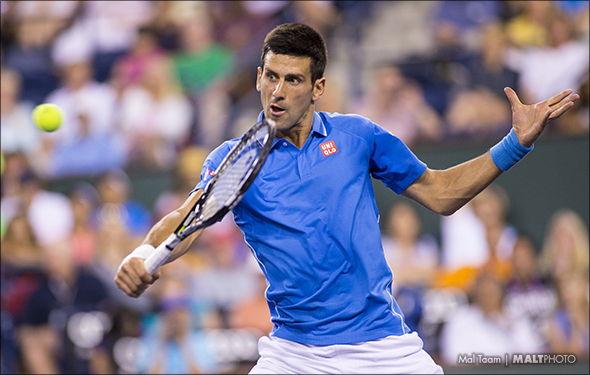 But in the breaker, Djokovic focused, and he locked in, and when he won the second set, it was essentially over. While the No. 3 DelPo has had a terrific year, still, if he wants to win a major again — and to stay healthy — he must continue to work his backhand and his return. Other than that, he is a darn good player. Djokovic is a fantastic player, because he is now won 14 Grand Slams, tied with American Pete Sampras. Surely, next year, the No. 2 Djokovic can win another title, possibly at the 2019 Australian Open. That would be something else. The No. 1 played three marathons, before the semis started against DelPo. After the first set, he became injured, and after he lost 7-6, he told the umpire that he was going to retire soon. In the second set, he pulled out. He was sad, and a little upset, but the No. 1 Nadal knew that you cannot win all the time. He will always remember in the quarters against Dominic Thiem, winning it 7-6(5) in the fifth, which ended in four hours and 49 minutes. It was spectacular. But after that, his body and his leg was exhausted so there was no way he could continue. He did win Roland Garros, plus four more ATP Masters 1000, so in the fall, assuming he is feeling better, he will continue to push, and try to win it again. The last time he and Djokovic played against each other, he lost 10-8 in the fifth at Wimbledon. That was super close. Maybe they will clash at the ATP Final in London, or early. We all hope so. The Japanese looked great heading into the semis, beating Marin Cilic in five, running fast, leaping in the sky, and punishing with his forehand. He returned pretty well, too. But, once again, Djokovic is better than he is. His first and his second serve, and he can grind him down, also with his phenomenal backhand. I am not sure that Nishikori can upend Djokovic ever again, maybe once, or twice. In a five-setter at a Grand Slam, he can’t take a quick win. In the two out of three sets, sure he can lock in and upset Djokovic, but he couldn’t do anything on Friday, losing 6-3, 6-4, 6-2. That was a good US Open for Kei, but not good enough to win the title. The Belgian played well as he could, especially on the hard courts, because he has won a number of titles on clay, but the 25-year-old wasn’t ready for long, hard-court contests. At the US Open, he knew he had be very aggressive, with his huge first serves, and his heavy spin, with his forehand and his backhand. He did, and he battled, and he fought, and he pumped his fist, but he couldn’t make it. After he lost, the No. 8 Thiem said that he will always remember this defeat. But, perhaps in the fall, he can shake it off, and during the fall, he will add more variety. I would think that we will reach the ATP Finals in England. But that is a toss-up. It’s all in his head now.